Dr. Michael Hahn joined the Department of Human Physiology in 2012, after having spent four years as a research scientist at the VA Puget Sound in Seattle and five years as a faculty member at Montana State University in Bozeman. He received a B.S. from Colorado Mesa University in 1996, an M.S. from Iowa State University in 2000, and a Ph.D. from the University of Oregon in 2003. Between graduate degrees, he worked at the Mayo Clinic in the Orthopedic Biomechanics Laboratory, specializing in hand and wrist joint function after injury and joint replacement. His research interests have ranged from prevention of falls, to utilization of computational analysis tools (such as artificial neural networks, support vector machines, and genetic algorithms) for solving complex modeling and optimization tasks, to enhancing the performance of fly-casting. 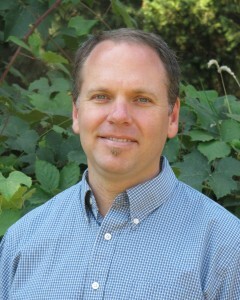 Dr. Hahn serves as Director of the Bowerman Sports Science Clinic and Associate Professor of Human Physiology. He teaches courses in biomechanics and capstone research. Dr. Hahn’s research expertise is broadly defined by the mechanics and neuromuscular control of human locomotion. Current research projects are focused in the areas of prosthetic engineering, treatment outcomes in ankle osteoarthritis, neural control of powered prosthetic/orthotic devices, and mechanisms of locomotor adaptation after lower limb injury.